From NASA: This composite image depicts Jupiter's cloud formations as seen through the eyes of Juno's microwave radiometer (MWR) instrument as compared to the top layer, a Cassini imaging science subsystem image of the planet. 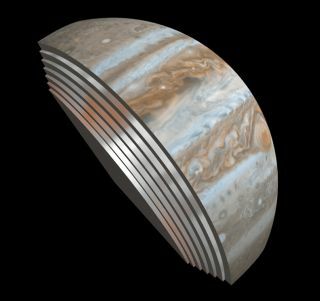 The MWR can see a couple of hundred miles into Jupiter's atmosphere with the instrument's largest antenna. The belts and bands visible on the surface are also visible in modified form in each layer below. PASADENA, Calif. — Jupiter's stripes are more than skin deep, according to observations by NASA's Juno probe, which has revealed many new surprises about the Jovian giant. Juno arrived at the Jupiter system in July. On Aug. 27, the probe made a close flyby of the planet, during which, the science team was supposed to calibrate Juno's instruments and get familiar with the intense environment around Jupiter, according to Juno principal investigator Scott Bolton. But the encounter proved more fruitful than expected. "The structure of the zones and belts still exists deep down," Bolton said during a news conference at the 2016 meeting of the American Astronomical Society's Division for Planetary Sciences. "So whatever's making those colors, whatever's making those stripes, is still existing pretty far down into Jupiter. That came as a surprise to many of the scientists. We didn't know if this was [just] skin-deep." The new images penetrate to depths of about 200 to 250 miles (350 to 400 kilometers) below the surface cloud layer, Bolton said. He noted that the bands seen on the cloud tops are not identical to the bands seen in the subsequent layers, although there is clearly a strong similarity. "They're evolving. They're not staying the same," Bolton said. The finding "hints [at] the deep dynamics and the chemistry of Jupiter's atmosphere. And this is the first time we've seen any giant planet atmosphere underneath its layers. So we're learning about atmospheric dynamics at a very basic level." Another breathtaking result came from the JunoCam, a visible-light camera that is being used for public outreach. The instrument took a snapshot of Jupiter's terminator line, or the place where night turns to day. As is the case with viewing the moon's terminator line, the change in light casts shadows, allowing viewers to see many features in three dimensions (like being able to see the depth of craters on the moon). In the Juno photo, scientists spotted a cyclone rising above the main atmospheric layer. The storm appears to be about 52 miles (85 km) tall and about 4,300 miles (7,000 km) wide, which is more than half the width of the Earth. The sunlit part of Jupiter was created by a citizen scientist (Alex Mai) using data from Juno's JunoCam instrument. JunoCam's raw images are available at www.missionjuno.swri.edu/junocam for the public to peruse and process into image products. NASA's Juno spacecraft is a 21st century orbiter to study the largest planet in our solar system. See how Juno will study Jupiter here. The first flyby also demonstrated that scientists have a lot to learn about what's happening inside Jupiter, the researchers said. The Juno team discovered that very close to the planet, Jupiter's magnetic field, its auroras and its gravitational field (that is, the characteristics of the planet's gravity at different points in space) all provided surprises. The auroras on Jupiter, which were first spotted by the Hubble Space Telescope, are not unlike the northern and southern lights that flash in the polar skies on Earth. But the data collected by Juno on Aug. 27 has thrown into question the models scientists had for Jupiter's auroras. "Nothing about the aurora that we measured on Aug. 27 was as expected," Bolton said during a talk at the meeting. The probe flew over the auroras with multiple instruments turned on, but "the things we expected to see weren't there, and things we didn't expect were there. "We're sort of sorting it out," Bolton said. "We've certainly got a mission of discovery [with regard to] the aurora and understanding that complex system." In addition, measurements of the planet's magnetic field matched planetary models fairly well as Juno sped toward Jupiter. But in the last few minutes before the probe reached its closest point of approach to the planet, the data drastically diverged from the predictions, showing that the magnetic field was much stronger than expected, Bolton said. That implies that the internal magnetic field is "much more complex than people thought" he said. But, of course, Bolton noted, no probe has ever come this close to Jupiter before, and the purpose of the Juno mission is to gather data that will put models like those to the test. More surprises came from preliminary measurements of Jupiter's gravitational field (that is, the strength and direction of the planet's gravity at different points in space). Bolton said the Juno team members who made initial models of the planet's internal gravity field "are already having to redo the field model" based on those early measurements. "The internal gravity field also holds a lot of guarded secrets that are going to help us understand Jupiter," he said. An infrared image of the southern aurora of Jupiter, captured by NASA's Juno spacecraft on Aug. 27, 2016. Juno's orbit around Jupiter isn't circular. Instead, the probe makes a loop that takes it right up next to the planet — to within 3,100 miles (5,000 km) of the cloud tops — and then far out into space, before looping back in for another close pass. Jupiter is surrounded by a donut-shaped ring of very intense radiation that could easily destroy most electronic equipment. Juno, with its unique orbit, does a thread-the-needle maneuver, slipping between the planet and the radiation ring. Right now, Juno makes one orbit every 53 days. Juno was scheduled to fire its engines on Oct. 19 and reduce its orbit to every 14 days. Because of a problem with the engine valves, the Juno team has delayed that engine firing until the issue can be diagnosed. Juno is still able to complete its science mission if it stays in the 53-day orbit, Bolton said.